Summary: Narrated by Cassie, a shy outsider who fears that an epic high school rivalry is about to go up in flames, the story follows the Trojans and Spartans as they declare war on the football field. After the beautiful Elena—who used to be the captain of the Spartan cheerleaders—transfers to Troy High and falls madly in love with Cassie’s brother Perry, the Spartans vow that the annual homecoming game will never be forgotten. Summary: The world is changing: the government has seized control of every aspect of society, and now, kids are disappearing. For 15-year-old Wisty and her older brother Whit, life turns upside down when they are torn from their parents one night and slammed into a secret prison for no reason they can comprehend. The New Order, as it is known, is clearly trying to suppress Life, Liberty, and the Pursuit of Being a Normal Teenager. But while trapped in this totalitarian nightmare, Wisty and Whit discover they have incredible powers they'd never dreamed of. Can this newly minted witch and wizard master their skills in time to save themselves, their parents--and maybe the world? Only a few more days to Enter Folks! +2 I posted on the wishlist post. +3 Will be posting all of my WOW links. Commenting to be entered, both of these sound interesting! Great idea! Please enter me! Oh these ones sound good! Thanks for the great giveaway Cindy! +2 commented on wishlist post. 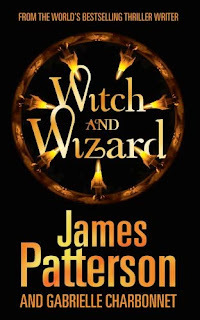 I enjoyed the Maximum Ride books (by James Patterson) and have been looking forward to "Witch and Wizard". Oh yay! I'd be interested in either, but my first preference would be for Witch and Wizard. +2 I commented on the wishlist post. Troy High sounds great! Thanks for the contest. Witch and Wizard sounds interesting! I would love to have James Patterson's arc. Love his writing. Would love to read Troy High and am interested to see what that Patterson book would hold. Great Idea Cindy! Sounds fun!! I wanted to read Troy High, looks interesting! +2 - comment on Wishlist post! Great books! +3 - added my WOW..will add again next week! I've been dying to read Troy High! +2 Already commented on wishlist post. Troy High sounds good - but I don't think that I would care which book if I won! I'd love to get Troy High. Looks like a fun read. If this is open to the UK, can I be entered for Witch and Wizard please? These books look good! Great giveaway! I would love to win either. Please enter me. Thanks for another great giveaway! Please count me in! I'd love Witch and Wizard! Both of these books sound great, both in a different way! I would love to win Troy High! Great contest! I especially want to win Witch and Wizard! The Troy High Book seems really interesting. I hope this contest is international.